Jim Tressel, leader of men and concealer of NCAA violations. There’s a certain point when a coach becomes bulletproof. 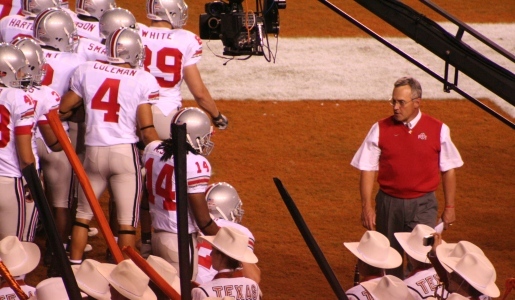 For Jim Tressel, his bulletproof status stems from his national championship and his .828 winning percentage while at the Ohio State University; that makes him a local legend and the pride of Ohio. Still, the NCAA isn’t as impressed with him. Ohio State Buckeyes head coach Jim Tressel has been suspended for two games by the university for covering up potential NCAA violations committed by his players. For his part, Tressel maintains his silence on the issue wasn’t related to avoiding NCAA sanctions, but an attempt not to compromise an ongoing federal investigation into the drug-dealing owner of the tattoo parlor who bought the Ohio State memorabilia from the cash-strapped players. To me, a real crime investigation should take precedent over the NCAA all day long, but Tressel’s failure to report this matter is troubling, especially considering all the trouble Ohio State has had with the NCAA under the Sweater Vest’s watch. Someone put Brutus the Buckeye on suicide watch.